Objective: The commonly used metabolizing enzyme inhibitors, 1-aminobenzotriazole (ABT), SKF- 525A, pargyline, allopurinol, menadione, methimazole, piperine and raloxifene, were examined for their potential inhibition of the major hepatic ABC (ATP binding cassette) and SLC (solute carrier) transporters. Methods: Different concentrations of the metabolizing enzyme inhibitors were used to study their effects on ABC and SLC transporters expressed in MDR1-MDCKI, Bcrp1-MDCKII, OATP1B1-HEK, OATP1B3-HEK, OCT1-HEK, OCT3-HEK cells and MRP2 vesicles. Results: ABT, allopurinol and methimazole had no inhibitory effects on MDR1, Bcrp1, MRP2 or on OATP1B1, OATP1B3, OCT1 or OCT3. Pargyline did not inhibit OATP1B1 or OATP1B3, but weakly inhibited OCT1 and OCT3. In contrast, SKF-525A showed inhibition of not only MDR1, Bcrp1 and MRP2 but also OATP1B1, OATP1B3 and OCT1. Menadione and raloxifene weakly inhibited Bcrp1, but the inhibition of raloxifene on MDR1 was as potent as on the xanthine oxidase pterin oxidation. Piperine showed inhibition of MDR1, Bcrp1, OATP1B1, OCT1 and OCT3. Conclusion: ABT, pargyline, allopurinol and methimazole have no inhibitory effects on the studied ABC and SLC transporters, suggesting the inhibitors are unlikely to cause confounding inhibition of transporters when used in metabolism studies. 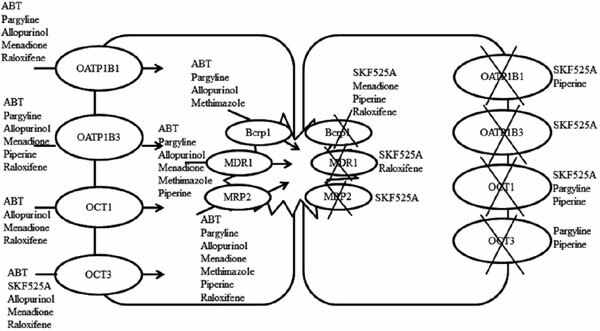 However, SKF525A, menadione, raloxifene and piperine can inhibit the activities of ABC and/or SLC transporters. Metabolic inhibitors, cytochrome P450, organic anion transporting polypeptide, organic cation transporters, multidrug resistance protein, breast cancer resistance protein, multidrug resistance-associated protein 2.